Are you looking for suitable solutions for filling paste in an automated manner? If yes, then you are at the right place. 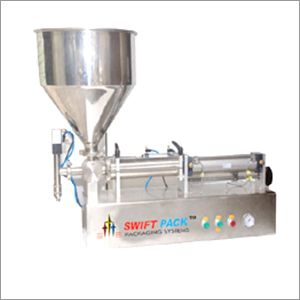 We are Delhi based Paste Filling Machine manufacturer, dedicated to serve the filling (packaging) requirements of cosmetic, food & pharmaceutical industries. This machine is sturdily constructed, easy to install, has low energy consumption of 20W. Depending on your application requirements, you can choose any of our models of automatic paste filling machine. As its leading supplier, we ensure to deliver only those filling machines that are based on latest PLC technology (programmable logic controller). The 3 models available with us have pneumatic and electric functions along with noiseless operation, simple speed controller for filling volume & speed, and automatic bottle feeding.